An internationally known environmental icon, Homasote Company is the oldest manufacturer of building products made from recycled materials in the U.S., and the only manufacturer of its kind in the Americas. Our 600,000 square-foot factory complex in New Jersey, is a few miles from the spot where George Washington crossed the Delaware on his way to the Battle of Trenton. Each production day we recycle (and keep out of landfills) up to 100 tons of recycled cellulose fiber. Every production year our unique manufacturing process helps conserve nearly 750,000 trees and eliminates more than 30 million pounds of solid waste that otherwise would go into landfills. Our environmental commitment goes beyond raw material recycling. Homasote Company is the first manufacturer in the United States to recycle nearly all water used to manufacture our products. The Company's process water, hundreds of thousands of gallons per day, is completely reused in a closed-loop system, a recycling feat recognized in 1956 by an award from the U.S. Army Corps of Engineers (the precursor to the U.S. Environmental Protection Agency). The Company has a fascinating history that began with its 1909 inception as one of the last offshoots of the original Bermuda Trading Company. Today architects, builders, specifiers, hobbyists, and others across the globe know Homasote Company for its exceptionally environmental, structural building and packaging products. The explosion of interest in green building, sustainability and energy efficiency championed by organizations, including the U.S. Green Building Council and its LEED™ Program, has made Homasote® products among the world's most recognized "green" building materials. Some of the most energy efficient, high performance LEED™ structures in the country are being built today with Homasote® products in their floors, walls, roofs and walkways. Eugenius H. Outerbridge founded Homasote Company in 1909 as the "Agasote Millboard Company." An industrialist who brought Homasote's secret manufacturing process to the U.S. from England, Outerbridge was the first chairman of what is now the Port Authority of New York and New Jersey. Those who have traversed the "Outerbridge" between New Jersey and Staten Island, New York will recognize our founder's last name. The 8,800-foot-long Outerbridge span, which opened in January 1928, is named in honor of Outerbridge the man - not because the bridge is "out" in the water or attached to the "outer" part of either state. Eugenius H. Outerbridge's Agasote Millboard Company first manufactured sanded panels for the lining and sides of railroad carriages. In 1915, the Company found that Agasote was suitable for automobile tops and for the next 10 years we also supplied board for the tops of Ford, Buick, Nash, Studebaker, Dodge and other automobiles. A derivative product, called, "Vehisote," was developed for delivery truck panels and it became a standard for Dodge and other trucks. Homasote® board first was introduced in 1916, as "Versatile Homasote Board," an un-sanded panel, strong and lightweight with excellent weather-resistant properties. Because it was impervious to weather extremes the board caught the eye of U.S. military officials who used Homasote® for the exterior of field hospitals and military housing in France during World War I. In 1925 a shift to canvas tops for automobiles reduced demand for Agasote® panels, so the Company responded by promoting Homasote® board's building and insulation properties. In a short time Homasote® became our most important product. Outerbridge recognized the long-term value of the growing Homasote® brand and officially changed the Company's name to Homasote Company. Famed explorer Admiral Richard E. Byrd relied upon Homasote® for his 1928-1930 Antarctic expedition. At his Winter Headquarters on the frigid continent the exterior and roof of executive offices, laboratories, radio station, clinic, mess room, kitchen, bunkhouses, machine shops, and magnetism observatory were covered entirely with Homasote®; its internal walls were insulated with Thermasote®. Byrd's structures were transported, knocked-down, on boats and sleds then assembled at the barren base. When the base was evacuated some of the buildings were knocked down and the board transported to New Zealand for storage. Today, the Pak-Line® Division of Homasote Company creates custom packaging from structural and non-abrasive Homasote® for shipping mechanical, electrical, and high-tech materials. Pak-Line® custom containers can meet highly complex packaging needs. Examples include all components for assembling a new truck, or delivering a replacement auto engine. Both were shipped overseas in Pak-Line® containers. After the parts were removed the Homasote® panels were knocked down and returned to the U.S., again to be filled with parts and re-shipped. This sustainable property appeals to exporters whose destination countries now impose import restrictions on wooden and cardboard packaging for environmental or insect- prevention reasons. I am not in the habit of using my few leisure hours to throw bouquets, I have too much to do, but I feel that merit deserves reward, so here goes - believe it or not, the above remarks are paled into obscurity by my present opinion of your fine product. When, as a technical observer, on the recently concluded Navy "Operation Highjump," I was one of the few who were privileged to dig down 12 feet to our old home 10 miles from the newest camp site. I found the 18-year old Homasote in the walls and ceilings of the "Mess Hall" and "Science Lab" (the only buildings we could reach) absolutely unharmed by time, water, cold. Hundreds of tons of ice had forced up the wood floors and pushed down the ceilings until they met in the center of the rooms, and puddles of ice everywhere evidenced the repeated freezing and thawing of the many seasons, but the walls were straight, unbuckled and scarcely stained. During the Great Depression Homasote Company became a victim of its own success. The nation's economy stagnated and retailers had difficulty making repeat sales. Ironically, the strength, quality and reliability of Homasote® may have affected repeat sales. Homes and other structures built over the years remain standing today, as much as seven decades after their construction. In 1935, after a major market research effort, the Company launched a new strategy to insure repeat sales, developing a new system of prefabricating housing called the "Precision Built System of Construction." Its first "modular" housing project was in Valejo, California, where 977 houses were built in just 73 working days. In 1939, the U.S. Navy chose the ice-free waters of Woody Island, 2.6 miles east of Kodiak, Alaska, as its principal naval base. Kodiak later became a major staging area for World War II north Pacific operations and its population soared to 25,000. From 1939 to 1940 Homasote® was used to construct barracks, mess halls and other facilities. Homasote® was selected because of its ability to withstand weather extremes and its insulative properties. With war around the corner, the construction demand for Homasote® increased significantly. The Precision Built System of Construction was used in a massive 5,000-home World War II housing project in at the Norfolk Naval Shipyard in Portsmouth, Virginia. A May 1942 Homasote Company newsletter described it as, "…the largest [residential housing project] that [was constructed] at the fastest speed ever attempted in the history of the world." World War II absorbed all of Homasote Company's output for military housing and base work across the globe. The Iron Curtain was raised after the Second World War and Homasote® had another cold-climate assignment. It's ability to resist weathering prompted the Government to specify Homasote® in construction of the Distant Early Warning ("DEW") line - radar sites along the Arctic Circle that swept the sky to alert Western forces to an impending Soviet sneak attack in enough time to mount a response. 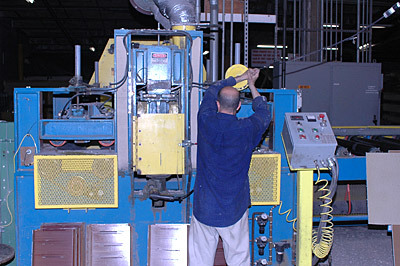 Homasote® had been known anecdotally for years as a sound-control panel for floors and walls. By the 1980's the need for economical sound control in homes and commercial buildings was growing. Architects knew our board well from their college years (in addition to its other advantages, Homasote® is the best tackboard made) and wanted to specify it for floors and walls. But they required statistical, not anecdotal, data in order to specify Homasote®. Responding to architects and specifiers who needed more than our assurances that Homasote® controls sound, the Company invested in a battery of independent laboratory tests. The results proved Homasote® to be an excellent sound-dampening product that reduced ambient and through-the structure sound. The tests gave our panels the imprimatur that allowed them to be specified with confidence by architects. We responded by marketing and advertising the panels as 440 SoundBarrier®. Now it is regularly specified by architects for floor and wall assemblies. PINnacle™ is the newest Homasote product, an interior panel of 440 SoundBarrier® sanded on both sides to create an elegant looking and uniformly smooth tackable surface. Ready for immediate use for all display applications with no additional finishing necessary, PINnacle is ready to receive fabrics, wall coverings, paint or dye. It is the latest generation of Homasote® panels that have been the benchmark for pin-retention characteristics for nearly a century. 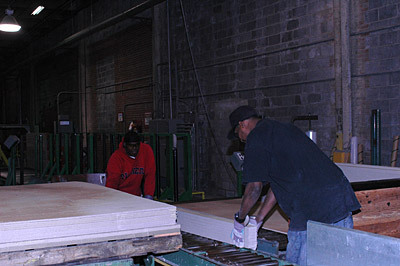 In 2003, Oriented Strand Board ("OSB") and plywood prices began to escalate. By early 2004 they had skyrocketed to new heights. Builders looking for an alternative have put 440 SoundBarrier® back into focus as an exterior sheathing, a use for which it dominated in many markets over the years. After "Versatile Homasote Board" was introduced in 1916 our panels became the exterior vertical sheathing of choice for many builders, a position it held right up to the introduction of then-less-expensive OSB in the late 1970's. Now Homasote® costs the same or less than OSB or plywood and it's a superior exterior vertical sheathing as demonstrated by independent laboratory tests showing greater shear, permeance, nail pull and other physical factors. Building products suppliers are recognizing Homasote's superiority and making sure that they have enough 440 SoundBarrier® in stock. 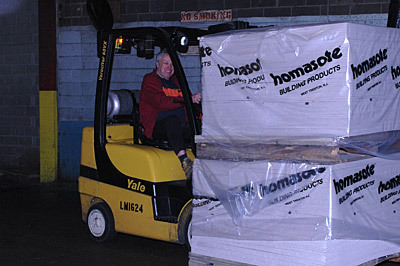 The unique Homasote® manufacturing process begins when tons of post-consumer paper and newspaper are delivered to our plant and pulping employees separate cardboard from paper to be processed. 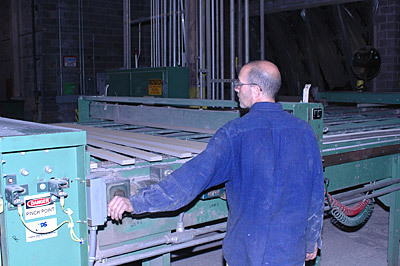 The cardboard is bailed and resold to another recycler since its long fibers are not compatible with the Homasote®. 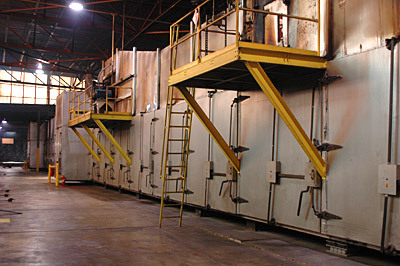 Paper to be processed is transported on a six-foot-wide conveyor and dropped into a giant hydrapulper, a steel cylindrical vat and blender, approximately 13 feet deep and 20 feet wide. Inside the hydrapulper 18,000-gallons of swirling 140° F water transform the paper into a slurry with a distinctive grey color that comes from the ink on newspapers and other printed matter. A high-speed rotor at the bottom of the hydrapulper keeps the slurry in motion and pushes small pieces of cellulose fiber pulp through a screen for additional processing. Additional equipment removes non-paper material down to very small particles that are removed centrifugally in cyclone devices. Finally, a small amount of wax emulsion and biocide are added to the slurry which, at that point, is comprised of 98 percent water and 2 percent pulp. The slurry is pumped into holding tanks, ready to be molded into Homasote®. 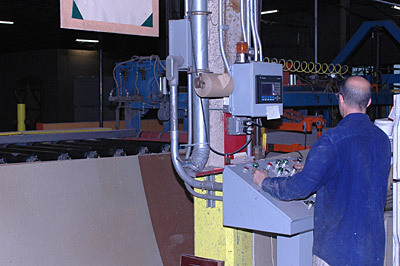 To create Homasote® board the slurry is pumped into 8' x 12' forming molds that shape the product by squeezing nearly 25 percent of the water out of it. A squeezed, formed "mat," now 75 percent water and 25 percent pulp, is moved on rollers into giant presses where it is receives from 1,600 to 2,200 lbs-per-square-inch of pressure before it is transported through a 300 ft. enclosed dryer. Prior to drying the board is approximately 25 percent water. At the end of the drying process finished Homasote® board is approximately 5 percent water, 3 percent less water content than plywood. 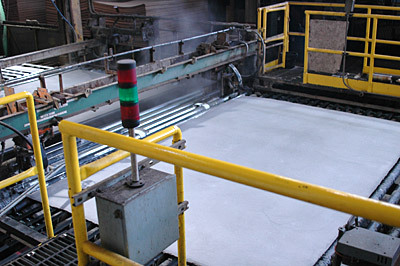 After molding, pressing and drying, the sheets are ready to be cut to size to be made into a variety of Homasote products. 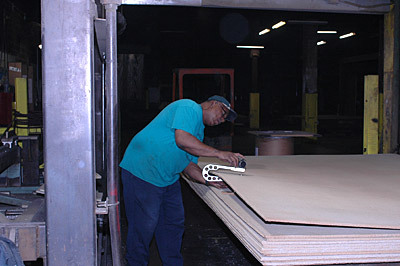 No other fiberboard is manufactured like Homasote, nor does any other board match its physical properties. The result is a weather-resistant, structural, insulating, extremely durable board with two to three times the strength of typical light-density wood fiberboards. To see more about how Homasote® is made. Click here.